“Whether you are in a wheelchair, have a physical deformity or anything that people may consider WRONG with you, if anything, it is everything that is RIGHT with you. 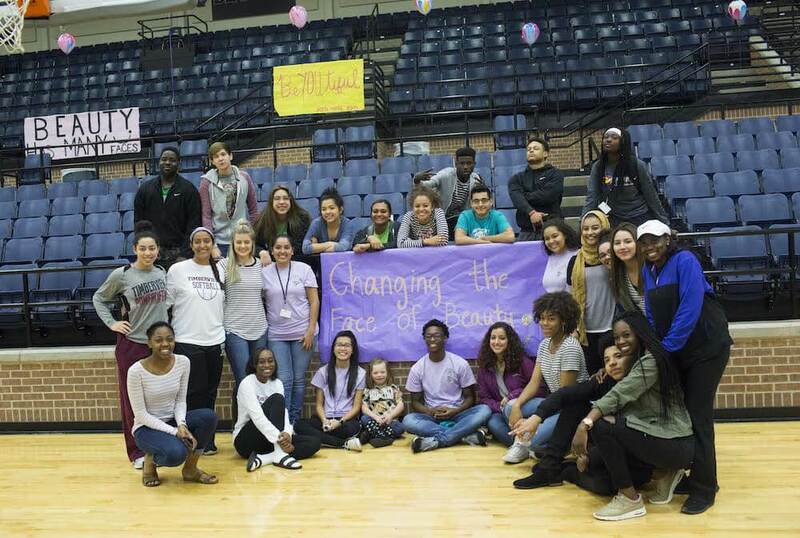 You are who you are and you are ALIVE in this moment so you SHOULD be able to enjoy it.” – Mansfield Timberview High School Students! Grace and I boarded a plane this past Tuesday because we just knew there were some students we absolutely had to get to know. We here at Changing the Face of Beauty understand there will be no change without the “future” on board. These students in this gym will be the company owners, marketing executives, photographers and videographers in a short 10 years. They will be faced with situations in their every day life and their professional life to make decisions. They will have the choice to live a life of inclusion or segregation and we hope the conversations we had with them this week come to mind. We hope they remember the largest minority in the world. Those people who are living with a disability. We want change when it comes to our advertising voice. We want marketing departments to remember when talking about diversity, that includes the disability community. We want everyone to feel seen in our media. There is no room for failure. The time is now and meeting these students gave us a renewed hope that the slate we are writing a new story on is clean, fresh and ready. The students at Mansfield Timberview High School in Texas radiate future and possibility just like other high schools and colleges across America. Students want to see change and be a part of that change, especially when we educate them about why it is important. We are SO PROUD to announce that we have signed a contract with SolidLine Media here in Chicago. The same media company that produced our story in the beginning. We will be producing a PSA with the team from SolidLine and the help of New York Times best seller, author, Kelle Hampton that will follow 3-4 adults who happen to have a disability. We will tell their stories about how media and advertising has affected their life. We have an expert in the industry who will weigh in on how their national brand has and continues to include people with disabilities in their advertising since the 1990’s. We hope to paint a picture that will educated our future to make good educated decisions when faced with diversity decisions as they move forward in their personal and professional lives. This video PSA will be available for schools at the beginning of the 2016-17 school year. It will be available to travel the world. We will add your name to a list that will be updated through out the coming months until the PSA is released. Until then…..take a moment and listen to the future.